The day has been so on-and-off — a little sunny, a little grey. 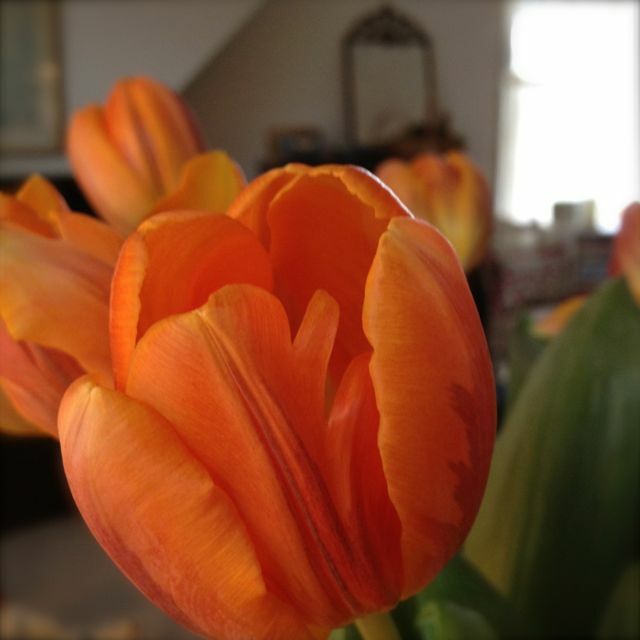 This week’s tulips make it seem a lot brighter! With just a few rows to go before I finish knitting my Zephyr Cove shawl, I’m beginning to plan my next project. I love knitting it, and I almost — almost — don’t want it to end. Will I decide to finish the scarf I’m knitting for The Remarkable R Rebecca? Will it be something I find while browsing Ravelry? Something with yarn that is calling to me from my knitting basket? Or will I settle down and really finish the designs I’m this close to getting done? What do you do when you’re about to finish a project you’re really enjoying? When I’m nearing the end of a project, I’m already thinking of what I’ll do next. No matter how much I love the current one, I can’t wait to cast on something new. Much as I try to live in the moment . . . and just enjoy the finishing up of a satisfying project. . . my mind is always clicking away at what I might knit NEXT. The possibilities are endless. I think I love that about knitting. . . deciding what’s NEXT!